Pent Sheds - Bridge Fencing Ltd.
All Pent Sheds are manufactured from Swedish Pine Tongue and Groove Ship Lap 16mm x 125mm using Zinc plated nails for extra durability. Timber Frame consists of 38mm x 50mm. 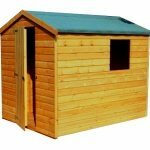 All our Sheds are Bolted together for easy dismantling if required. All Sheds are treated with Preservative. Glazing, roofing felt and Galvanised Pad Bolts and T Hinges are standard. All prices include Installation and Delivery to the Liverpool and St Helens area. 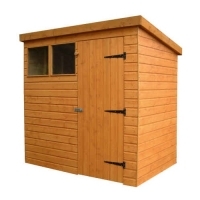 Be the first to review “Pent Sheds” Click here to cancel reply.